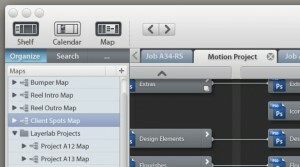 The company, Gird Iron Sofware, calls Flow a “Visual Workflow Manager.” I call it a miracle. Programmers had versioning tools since the begining now it's time for the designers to get theirs. And it's a really good one. Flow follows a project’s workflow by tracking and mapping out the revisions a file has gone through during your work process. It manages your project files, how they’re related to each other, and where they’re located. Say that you have a final document for a client. It’s a PDF file that includes particular fonts and several images. 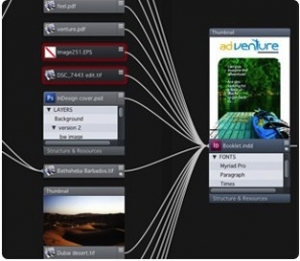 Drop that PDF file onto Flow, and the application maps out the assets and the iterations of those assets for you. 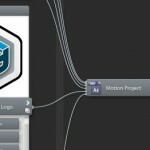 Double-click on a previous revision of an asset, such as one of the images, and Flow finds it on your computer instantly. Flow will let you know if you are missing any of the fonts in a project file. Flow doesn’t care what the names of the files are; it identifies them through an ID number so even if you can’t remember what you named a file, Flow will find it for you and map it. Flow not only gives you a history of a file and its iterations but allows you to revert to any version as needed. They call this “Visual Versioning.” You can also perform a “Visual Search” to locate any file and to see a visual diagram of how it fits into the project you’re working on. One of my favourite features is the asset tracking across multiple programs. Without any intervention from the designer, Flow will detect copy/paste and import functions from application to application. That means it can tell that you've created a vector in Illustrator, imported it into Photoshop, and then exported it to JPG and added it to an HTML file. Another nice feature is the ability to track how much time was spent working on a particular file or on a project as a whole. This actually fits quite nicely with how I used to determine how much time was spent on a project. I've often gone through my email and phone logs to see which project I was working on at any given time. Timesheets have always been a hassle and this would definitely help me get a more accurate view of where my time is being spent. I like how it'll automatically version the files that you are working on and even tracks when you do Save As. You'll be able to configure how far back a file is versioned so as not to eat up your entire hard drive (although considering I barely use 20% of my drive now, I'm not overly concerned). It creates thumbnails of each version, letting you quickly eyeball changes from version to version. It'll even track files on network drives or on removable storage.